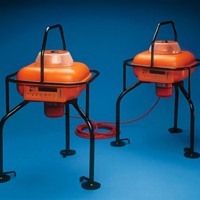 Detective is the unique solution to temporary gas monitoring installation, ideally suited to shut downs or other short-term operations. The Detective operates from internal rechargeable batteries and can be put into place and set into operation immediately without the need for power or other infrastructure. Intrinsically safe, Detectives can also be linked together to provide temporary area monitoring systems, where all linked units show any alarm condition but units actually detecting gas indicate by the visual alarm lights flashing at twice the speed. and are unsuitable for use in pumped instruments.